Minimally, to bind hierarchical data you must assign the DataSource, DataFieldID, DataFieldParentID and DataTextField properties of the RadTreeView. Optionally, you can assign the DataValueField property. 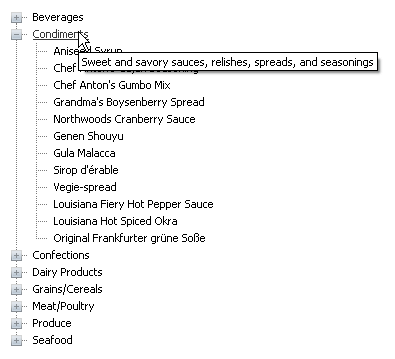 The following example binds to a query of the Northwind database Categories and Products tables that are joined so that they form a hierarchy. The raw data from the query looks something like the example below. You can also use the Database.mdb Access file found in the RadControls installation directory under \Live Demos\App_Data. This Access file is already in a hierarchical structure and can be queried directly without additional manipulation in the join. Also, see Getting Started, Binding to a Database for more examples. When bound to the RadTreeView the application looks like the screenshot below. In the BindToDataTable() method below, the hierarchical query is created, loaded into the DataTable and assigned to the DataSource property of the RadTreeView. 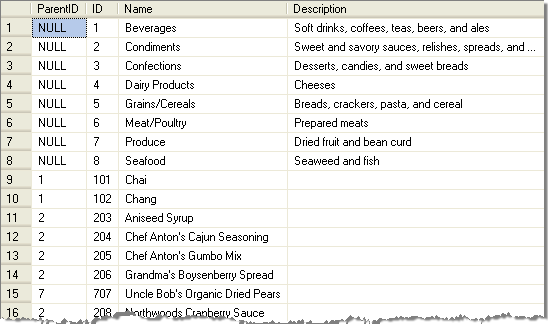 The "Name" of the category or product is assigned to the DataTextField for display in the TreeView. The DataFieldParentID property is assigned null, for top level categories, or the id of the category. A unique identifier must be assigned to the DataFieldID; in this case the identifier is the CategoryID or a number constructed from the CategoryID and ProductID combined. Optionally, you can assign the DataValueField. Also, you can optionally create a handler for the NodeDataBound event and use any of the bound columns; in this example the Description column is assigned to the Node ToolTip property. Const sql As String = "select ParentID = null, ID = CategoryID, Name = CategoryName, Description from Categories " + "union all " + "select ParentID = CategoryID, ID = (CategoryID * 100) + ProductID, Name = ProductName, Description = '' from Products"
For a live example of binding to hierarchical data see Hierarchical Data Binding.